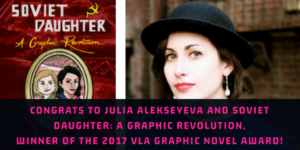 We reached out to Soviet Daughter creator Julia Alekseyeva to chat about the amazing graphic novel’s reception, praise, creation, and purpose. Check it out below, grab a copy of the book, or follow Julia online to learn more about her work. I was very surprised, and even more pleased! It has been a bit difficult getting standard comic committees and authorities interested in the book and story. Readers have responded very positively, but independently published books seem to have a severe handicap in the comics world. So I was pretty shocked, to say the least! I’m especially thrilled that the award came from the Virginia Library Association, and that it highlights diversity. I’m an educator myself and created the book for the purpose of education on a rarely-understood topic: daily life and politics in the USSR. I also wanted to highlight the experiences of a figure that was a minority in her own community, even if she probably wouldn’t be considered one now in the US. I’m thrilled about the praise the book is getting! I’m so glad it’s connecting with readers– both those who came from former Soviet states, and other people in the US and abroad. I received some great feedback from readers in Ukraine, actually, and really hope that the book ends up getting published there one day. I think many people assume that citizens of former Soviet states may not like the book because it showcases a history that comes with extremely heavy baggage and trauma. However, I have not actually had this criticism happen (which is fantastic)– former Soviets seem to connect with how ambiguously the book treats the Soviet government. It’s definitely a gray area, and in my experience, readers from places like Ukraine, Bulgaria, or Kazakhstan read the book as a testament to the complexity of Soviet nostalgia. It isn’t necessarily a nostalgia that wants to restore the past (Svetlana Boym called this ‘Restorative Nostalgia’) but one that, hopefully, reflects on the past without wanting to abandon it wholesale (‘Reflective Nostalgia’). I love getting feedback that the book ‘gets history right,’ or at least the feeling of living in a very particular moment, in a very particular place. And that’s high praise to me. I definitely feel like two types of generations gravitate towards the book: Millennials/’Digital Natives’ (those under 38) and an older generation who may be grandparents themselves (‘Silent Generation’ and older). Unsurprisingly I think the book is more appealing for people interested in learning more about leftism throughout history. It makes sense that the reader demographic lines up pretty well with the demographics of the Democratic Socialists of America! (i.e. younger generations and much older generations, with not a lot in between). I think this has less to do with the content of the book and more to do with the types of books 38-58 year olds are likely to consume. This may have to do with experiences of the Cold War and an immediate gut reaction against anything with ‘Soviet’ in the title. In my experience, Millennials and older folks take a lot less convincing than the demographic in the middle! I think the story resonates with readers because it really is a personal account, rather than any objective idea of history. I didn’t fact check any of the statements Lola made because they are her story and her truth. She was writing this memoir in secret and had no reason to lie since she knew she’d be long gone by the time we read it. It is a subjective history and a visceral experience of daily life. Oh, boy! Honestly, I have no idea. I’ve made quite a few shorter pieces since the book was published, but haven’t had the urge to do something quite like this again. I’m not sure how I was able to be so motivated! I was very organized and set all of these nearly impossible-to-meet deadlines, and actually made all of them, with significant difficulty. I think I was able to stay disciplined and motivated because I knew I would not be able to support myself financially for very long (I lived on savings for one year). More importantly, I just wanted the story out there. I thought there was something in the air that made the word ‘socialism’ appealing, for the first time in my life in the US. This was 4 years before Bernie Sanders became a household name and the most popular politician in the US! I thought if there ever was a time for the story to reach an audience, it was now (or rather, 2013-2017), and I think I was right! I also had this deep, psychological urge to pay homage to my great-grandmother. Drawing/writing is somewhat therapeutic, as it was a particularly intense way of expressing love, devotion, and respect. Hmm! I’m not sure I would’ve done anything differently in terms of the final product. There was quite a bit of trial and error as I went about my drawing and editing process, and while it would have saved me a LOT of time and art supplies to have already known my strategy on Day 1, it was also a great learning experience. So, all those accidentally spilled containers of India Ink and stained wooden floors and broken nibs and coffee-spilled laptops are probably an important part of the process, and I wouldn’t have given up that craziness for anything. I do think the book would be a tad better if the format were larger; maybe, just maybe, there can be a larger reprint of the book that keeps the same dimensions? In terms of my favorite part of the book: it’s hard to say, but probably my favorite parts are the more positive scenes from the early 1930s. 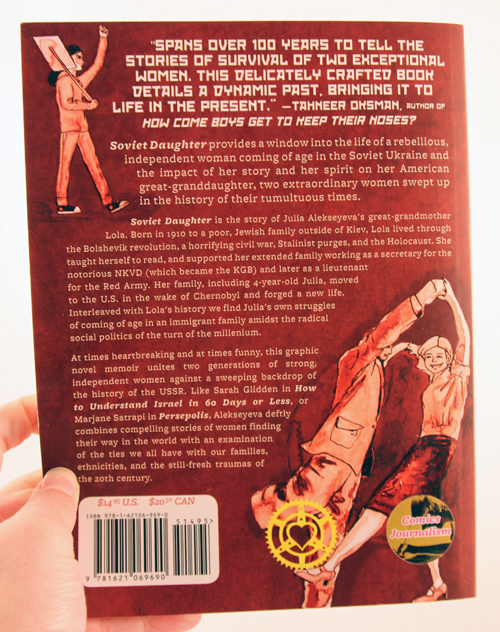 Lola’s life pre-WWII is so fascinating and fun. It reminds me so much of my own scene in Brooklyn, weirdly enough. I know the comparison is a rather crazy one, but there’s actually quite a lot in common in terms of the combination of radical politics/socialist organization and fun hang-outs or party scenes. Lola was interested in politics, art, film, theater, dance, music. I like to think that if she were a Millennial now, she’d live in my neighborhood and dance up a storm in Crown Heights and Bed-Stuy! 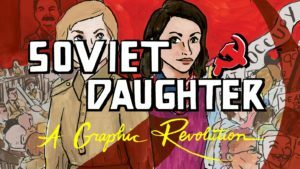 (Above) The original Kickstarter video for Soviet Daughter.